Google Pixel Issues? Let us Help! Google continues to innovate and surprise us with their phone offerings. Their Nexus line was a very popular android phone that continued to evolve. 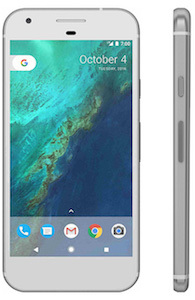 Now they have released their new line, Pixel and Pixel XL. These phones have gotten rave reviews from critics and have gained in popularity. When it comes to android devices, you can’t dismiss the Google phone. Just like any good device, they are also very fragile. Your Google phone might need diagnostics, lcd/glass repair, battery repair just like any other phone. Don’t fret because your in good hands at Smart Fix. We have the knowledge and the experience to handle new devices. We have the resources to find you the best replacement parts. Come see us anytime for your Google Pixel Phone Repair needs! Dropping your Google Pixel is the worst feeling, especially when you turn it over and find a big crack down your screen. At Smart Fix, we specialize in phone screen repairs. We use only the best quality parts to ensure that your phone feels and works like new. Jumped in a pool and forgot your had your Google Pixel in your pocket? No problem! At Smart Fix Las Vegas we have one of the highest success rates for water damage phone restoration. We put your phone through a day long process which cleans any residue left behind from the initial submergence. To ensure that your phone can be saved we advise keeping your phone off after the initial contact and bring it in to any of our two locations in Las Vegas as soon as possible. The longer the wait, the more likely rust will set into the Pixel rendering it useless. One of the most used portion of the phone susceptible to wear and tear is the charging port. The charging port is one of the most common fixes that we deal with at Smart Fix other than screen repairs. Since this part of the phone goes through daily use it makes sense that this is a popular issue to repair. Button replacement is another common repair that we perform at Smart Fix. We can fix buttons that no longer click as well as reinsert a button that has fallen out of the phone.